How many jobs we add this month or last is less important than the longer term goal of real recovery from the Great Recession. And on that score, we still have some ground to cover. Each month about this time, the Bureau of Labor Statistics updates its regional and state job numbers. It’s an important monthly scorecard, an opportunity to measure the state’s performance against the experience of other states, the national picture, and our own recent employment trends. And it’s an important political moment — especially as Governors around the country (and here in Iowa) have tied policy and budgetary decisions to job creation or employment targets. But this monthly flurry of interest can also distract us from the bigger picture. How many jobs we added this month or last, after all, is less important than the larger and longer term goal of real recovery from the Great Recession. And on that score, we still have some ground to cover. The graph below (from our State of Working Iowa report, updated through March 2013) compares the 2007 recession to all other postwar recessions, for Iowa and the United States. For the country, the 2007 recession is deeper and longer than any other postwar downturn. Now more than five years (63 months) since the onset of the recession in December 2007, we are far short of pre-recession employment levels. 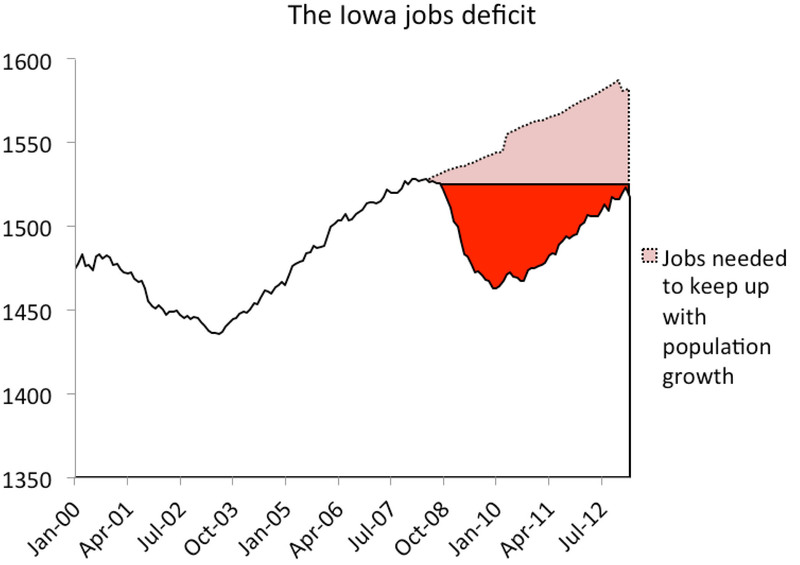 For Iowa, the picture is a little better — but we are still 7,700 jobs short of the pre-recession peak. This is only part of the story. As the recessions (and weak recovery) have dragged on, the state has continued to add to its labor force: now five year’s worth of immigration, in-migration, and high school or college graduations. So our real jobs deficit is not the number of jobs we are short of the pre-recession peak. It is the number of jobs, given our current labor force, we are short of returning to pre-recession rates of employment. That deficit, captured in the graph below, is over 65,000 jobs. In order to clear that deficit in the next three years (during which time the labor force will continue to grow), we would need to add over 80,000 jobs — about 2,000 a month over that span. Over the past year, or rate of job creation has been about half that (averaging only 920 jobs/month).